Spooky Marion’s Josh Simpkins standing over his buddy Bill Russell after having just “murdered” him. I’m sitting in my friend Bill’s pitch-black basement on Halloween wearing an old pair of coveralls and a rubber Michael Myers mask. The whole situation is so singularly weird that I’m starting to creep out myself. But then I hear Bill and his younger brother, Dave, stomp up the front porch steps above. Bill unlocks the front door. He tries the light. “That’s weird,” he says. “The electric’s off.” Of course there’s no electric. I had popped out the circuit breaker twenty minutes before, just as Bill and I had arranged. 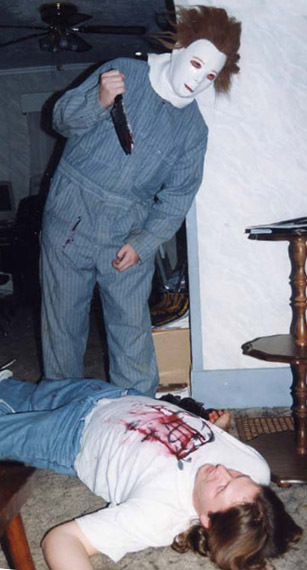 If all went according to plan, we would succeed in playing a killer (pun intended) Halloween prank on Bill’s unsuspecting brother. Of course, people around Marion have been pulling scary pranks on one another, especially around Halloween, for a long time. To read about this prank and others that have happened over the years in Marion, pick up a copy of Haunted Marion, Ohio.